* Listening to music is good for digestion. * The word cash originally referred to a money box. * By 2040, robots may become as intelligent as people. * Grasshoppers hear with the fronts of their knees. * Reebok shoes are named after a type of African gazelle. * 11,111,111 X 11,111,111 = 123,456,787,654,321. * The word hiccup appears once in the works of William Shakespeare. * Scientists have revived bacteria that were dormant for 250 million years. * If you’re floating in space and you fart, it will generate enough force to propel you forward. And hundreds more facts just like these! Book Cover Image (jpg): Uncle John's Did You Know? 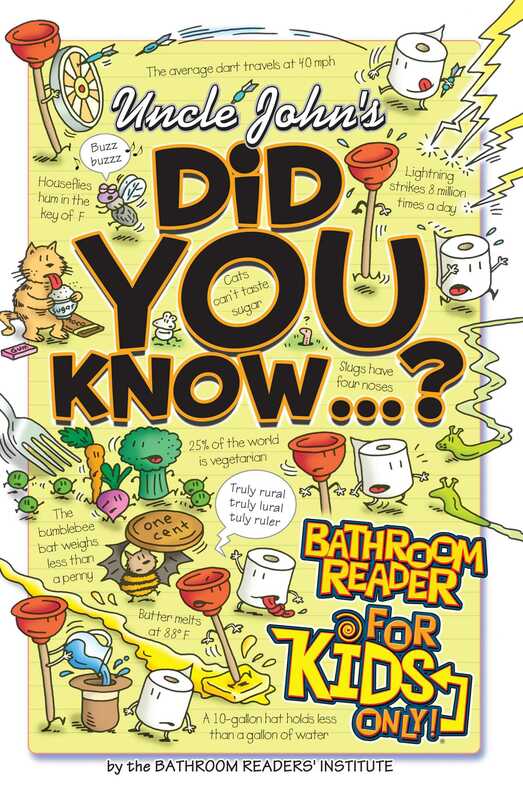 Bathroom Reader For Kids Only!